January 13, 2012 by Venky. In 2010 when I was in Vermont I wanted to buy a road bike and was saving for it. I was looking at various bikes. I always had a fancy for classic steel road bikes and I was keeping an eye out on Craigslist. Apart from that my eyes were set on bikes that are supposed to be do-it-all bikes like Bianchi Volpe and Surly Cross Check. But by the time it was time for me to come back home, due to other financial commitments I ended up coming back with just one bike, the Bulldog, which I bought for all of $175 in May 2010. After coming back home in Sept 2010, with other priorities in life taking lion’s share of the dough I didn’t have enough to spend on a good road bike. I was not sure what I wanted to buy too. All I was sure was that I didn’t want to buy just any bike that had gears like the first time I bought a bike(Hero Hawk). I decided to play the waiting game. I was enjoying riding the Bulldog anyway and it was serving me very well. Then the goal that I had at the back of the mind of trying TFN on my Bulldog also materialized with my registration for TFN being accepted. So, all my training was going to be on that bike. So to go with the ‘no-cash’ scenario, now there was ‘no-need’ of a road bike. At least not until after TFN. As my training progressed and my Nandi climb reports kept piling up, many of my good friends were concerned of the health of my knees in the long term. They were very rightly warning me about the possible negative impact of mashing up a hill on a big gear(42×15) that I have on my Bulldog. That got me thinking and I assured them that I don’t intend to climb with my fixed gear bike forever and that I’m going to buy a road bike soon. But I had no idea when I will buy one and what I wanted to buy. 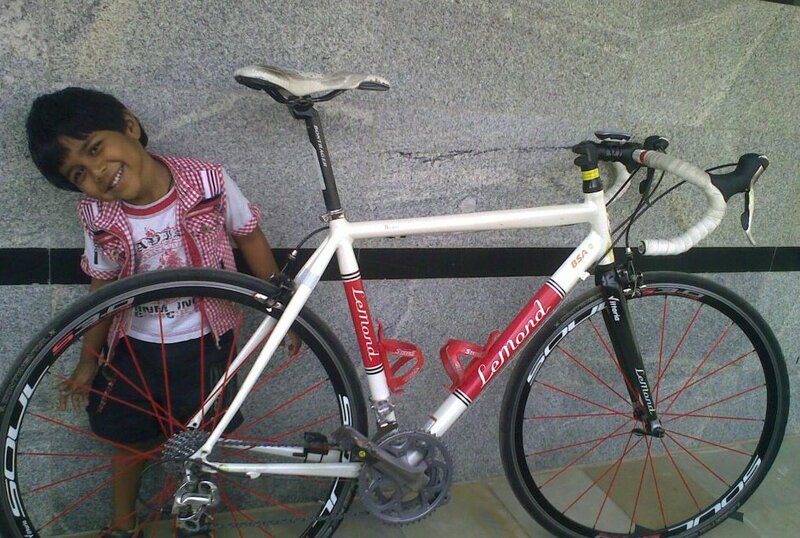 Then one fine day I saw an for-sale ad on BikesZone of a beautiful bike, Siva’s Lemond. But the thought of buying it didn’t even cross my mind after looking at how much he spent on that bike. I just wished that the beautiful bike would find a good home. But after a few days when Siva quoted what looked like a super price for the bike, I jumped up and quickly responded to him saying that I will take it. But there was a caveat. I told him that I could not take it immediately as I didn’t have cash but I assured him that I will pay and pick it up for sure after TFN. That meant more than two months later. Any seller would not think twice before refusing such a stupid offer. But not him. He agreed to keep the bike reserved for me. He was also kind enough to offer the bike immediately and asked me to pay him later. Another good friend offered to loan me the cash needed to buy that bike so that I can pick it up immediately and ride it in TFN. I’m only telling you this to show how lucky I’m to be surrounded by such fantastic friends. But I still wanted to go ahead with my initial goal of riding TFN on the Bulldog. By that time my training was going so well that the doubt of ‘can I do it’ was slowly being replaced by a belief that ‘I can do it’. But believing and doing are worlds apart. So I wanted to do it and see if I can. So, I thanked both of them for their help and told that I wanted to pick it up only after TFN. So after a good TFN, I’ve finally picked up the Lemond on 5th Jan. Siva was again kind enough to bring the bike to my home and hand it over to me. His love for the bike was pretty obvious when he told me that he is selling it to me on one condition that if I ever decide to sell, he should be given the first chance of refusal before I could sell it to anyone. I don’t think I will sell this anytime soon. What a beautiful bike it is! I just love it! After taking it for a small ride on Saturday to dial in the fit, I’ve joined Arvind, Ameet, Mohan, Ullas, Shankar and Sanjay for a ride to Nandi. As I was starting training from base again, the goal was to keep spinning and keep the cadence around 100 and stay on the small chain ring all the way. I was not sure if I could do that and still stay with the group. But fortunately the guys decided against hammering that day. We formed a paceline and kept going at a steady pace and reached base. The previous best climb time for me on the Bulldog was 31:20. The Lemond, I think, is a better bike than the Bulldog. At around 9kilos, it is a lighter bike than Bulldog which weighs in at around 11kilos of which one kilo is the weight of my saddle bag itself. The Lemond also has much lighter wheels. So, it should climb much better than the Bulldog. So, I was somewhat confident of a sub 30 minute climb on it. Mohan sir was more optimistic and was saying that the time could be around 27minutes for me. I was not sure. When the climb started Arvind was ahead of me and Shankar surged past me in the first 500m. I kept going stead and decided to take it by the feel of the legs and the HR. I never looked at the time and kept spinning. I slowly went past Shankar and was just keeping Arvind in sight. He was pacing himself beautifully and acted as a carrot for me. I went past him after 5km and kept going steadily. My nemesis, curve 33, is no longer a nemisis as I just shifted to a lower gear and kept going easily past it. It was just about keeping it steady after that and when I took the final curve and reached the arch to hit the lap button, I saw 27:02. Mohan, The Demon, was right after all. I guess, it is not a bad start for the Lemond on its first attempt. 🙂 The goal now is to try and reach sub25 by the end of the year. Avg cadence was 104 till Nandi base and 97 for the entire ride. AvgHR for the climb: 175 and avg cadence was 67 for the climb. 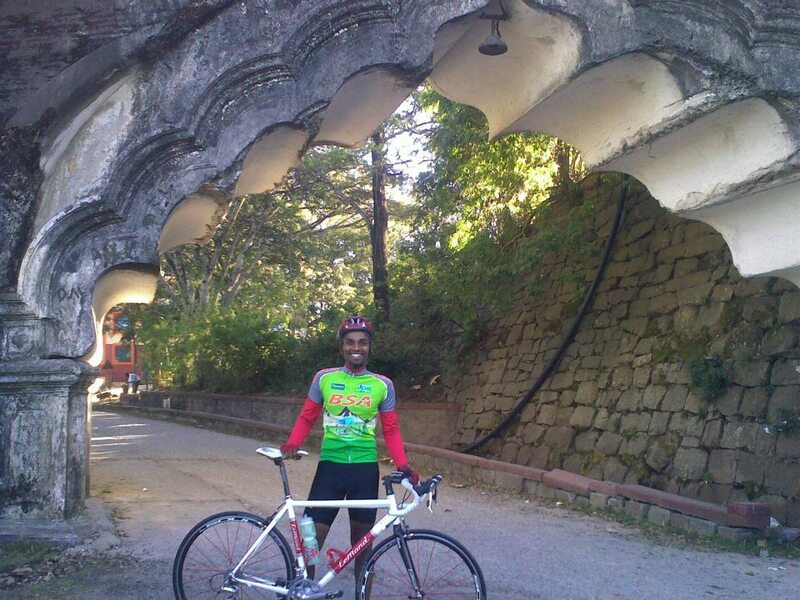 Oh yeah, I enjoyed coasting downhill on Nandi! Is this the beginning of a new chapter? Is BikeyVenky=FixieVenky=RoadieVenky? Only time will tell. LOL. Nice article. Wish you many thousands of miles on the Lemond…though Bulldog deserves to be retired in a manner befitting a TfN veteran as well 🙂 WTG Lord Venky!! !